Against the legal powers that be, Gawker gaming site Kotaku is reporting Burger King will offer its customers BK-branded Xbox games. 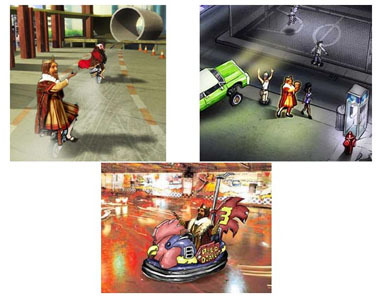 It's a promotion that offers one of three games (action, fighter, racing) with the purchase of a Value Meal. The creepy King will be featured in all the games. Kotaku writes, "The action game is apparently similar to Halo, while the fighter combines Street Fighter and Mortal Kombat." Greenfield Online, the company that did preliminary research for the creation of the games, is none too pleased and has sent a nasty legal letter to Gawker headquarters asking Kotaku to remove the story. They aren't going to. I mean it's all rather pointless anyway. Once the information's out. it's out. It's not like you can erase it so move on Greenfield and deal with it.